Saturday night, I introduced the service Youtify, a neat service which helps find top music videos and playlists from YouTube, and organizes them in a browser app that looks much like iTunes. Though I published late on a weekend, the story was quickly distributed, especially on Twitter, with nearly 150 shares of the story. But the fast rise to visibility has hit a wall for the service, thanks to problems that started late Tuesday night, when almost all the top videos from YouTube simply stopped playing. 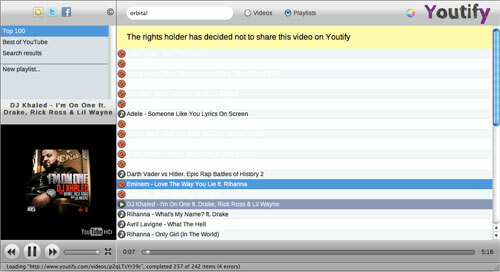 It turns out the rights owners for the music videos themselves, primarily record labels, put a stop to their content being played on the site, with Youtify specifically being blocked. Per Thulin, one of the cofounders of the project, along with Karl Tannergard, initially thought he had somehow run afoul of YouTube's API rules, as users found the video player was rendered almost completely useless. But after reaching YouTube, they confirmed it was the record labels, and not they, who had stopped access. That the record labels aren't immediately excited about yet another cool and innovative way to showcase their artists' content is no surprise. They've been late to the game and backward in practically every opportunity over the last 20 years. As Thulin wrote me in an email, the action caught them by surprise, especially as nobody made any attempt to contact Youtify directly. "Our new plan is to embrace and reward the artists and labels still allowing us to play their videos," he wrote. "We will let those artists and labels put ads in our application for free, and also let our community help spread these videos, generate good ratings, viewcounts, shout-outs on Twitter, etc. We hope that our growing community will generate enough noise for them to reconsider!" Unless the record labels change their mind, the most likely culprit being VEVO, who owns a large portion of the videos that aren't working, Youtify, for the time being, is somewhat hobbled. 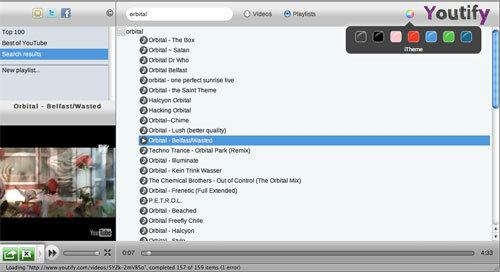 A small fraction of the Top 100 songs play, while amateur content from "Best of YouTube" still runs as will many searched for playlists that don't intersect by the resistant labels. The concept for Youtify is great. Even the user interface got a revamp in the last few days following the initial post. But the content is what it's all about, and if they are starved for content, users will probably not be made loyal. The question is will the labels let this one go, or will they remain obtuse?